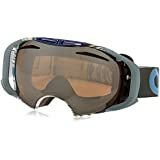 Whether you are heading out to get in a little snowboarding, some skiing or even snowmobile riding, one thing is for certain – you need a good pair of snow goggles. These are essential because they protect your eyes from UV rays and help you to see better when the sun’s rays are bouncing off that white snow. Keep reading to learn about our top picks when it comes to the best snow goggles for the money, as well as some reviews and tips on shopping for the perfect snow sports goggles. If you’re looking for the best snowboard and ski goggles that money can buy, then look no further than the Oakley Canopy Ski Goggles. 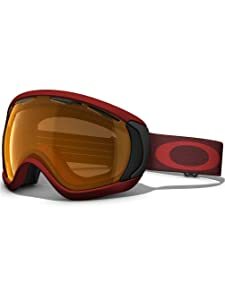 These are probably the most high quality snow goggles that I’ve seen on the market. They have amazing prizm lenses that are no joke. You get great UV protection that blocks UVC, UVB and UVA by 100%. The frames have a comfortable triple-layer foam that keeps wind and snow out. Plus, there is a moisture-wicking fleece lining that takes care of all that sweat. You can choose from over 20 different colors/tints to get the perfect VLT percentage for your snow activity needs. Price varies by color/tint, but is definitely a great affordable option. The frame itself has a low canopy design, which means optimal peripheral and downward vision while you’re wearing these. You’ll notice notice dual venting to help prevent fogging. The lens also has an amazing F3 fog coating that keeps your lens clear of fog in even the coldest of temperatures. The strap is wide and adjustable with a silicone lining that prevents it from slipping while you are in motion. And, these goggles are compatible with prescription eyeglasses and helmets! Oakley is known for making high quality lenses and we think these snow goggles are some of the best on the market right now. A good pair of goggles for skiing or snowboarding are just as essential to your winter gear as the right jacket, pants or snow boots. If you’ve ever been out there without a pair of goggles or with a really bad pair, then you know what a big difference the perfect pair makes when it comes to having a good day out in the snow. Keep in mind that not all goggles come with the features listed above. Continue reading and we will let you know more about these features so that you can easily make an informed decision on the best pair for your extreme weekender needs. Lenses are probably the part of the goggles that will be the most different from one pair to the next. With so many different variations of features available, it pays to learn about what you can get and what you actually need when you’re out in the snow. There are two different types of lenses that you will find in your ski and snowboard goggles. They will either be spherical or cylindrical. Cylindrical lenses are sometimes called flat lenses because even though the lenses have a horizontal curve, the lenses remain flat vertically. 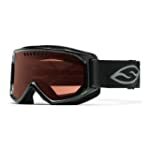 The benefit for snow goggles with flat lenses is that they are usually the cheapest types of snow goggles. Spherical lenses are curved both vertically and horizontally. You can usually tell them by look because they have a sort of bubbled design. This type of lens is typically in a higher priced snow goggle. Of the two types, spherical lenses offer more benefits. Due to the optimally curved design, the surface area is greater, which results in better peripheral vision while wearing your goggles. Spherical lenses are also designed with strategically placed curves that give you the maximum in anti-glare protection. 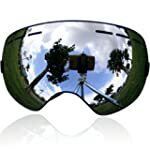 The cylindrical goggles can also have anti-glare measures, but due to the existence of more surface points, you’re going to have some blind spots. That means that the anti-glare is not as good with cylindrical lenses. Visual distortion can also be a problem with cylindrical lenses, but only at certain angles. Fortunately, spherical lenses reduce this problem due to lens tapering along the edges. Most snow goggles are anti-fogging, but since spherical lenses are farther from your face, you have a reduced change of fogging. As you shop for new goggles, you’re going to see a lot of different colors and tints on the lenses. The truth about these is that they filter out light differently. And, you need to go with the color or tint that best matches the conditions that you’ll be experiencing. Typically you will see the light filtering capability listed as VLT, or Visible Light Transmission. Usually it is listed as a percentage of the light that is allowed through the lens. 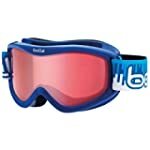 If you want snow goggles that perform well in low sight situations, then you should look for goggles with a VLT of 60% to 90% and that are blue, pink or yellow. If you’re going to be out on a sunny day, then you need goggles that keep out too much light. Your best bets are goggles with a VLT of 5% to 20% and colors of gold, grey and black. The rest of the colors and tints on the market are your all-conditions models. These are designed to adapt to changing light conditions. If you’re an experienced skiier or snowboarder, then you already know that conditions can change out there at any time. As a result, it’s a good idea to use some snow goggles that support interchangeable lenses. This is much easier than keeping multiple sets of goggles on hand. With interchangeable lenses, you can swap out the lens on your snow goggles as soon as your visibility conditions change. This ensures that you’re always seeing as well as possible, which helps to keep you safe out there. The only downside to a set of ski goggles with interchangeable lenses is that they often have a higher price than regular googles. While the features that you see above are the main things that you’ll see when shopping for your ski and snowboard goggles, there are a few other specs that some manufacturers are adding to the goggles. While not all of these features are necessary, you will find that some of them do enhance what you get for the money. Anti-Fog Coating: some lenses have a chemical treatment that reduces fogging tendency. This type of coating typically requires special care cause you can easily wipe it off when cleaning improperly, so if you get a pair with this feature, then read the care instructions carefully. Mirrored Lenses: if you’re going to using the goggles in bright conditions, you can reduce glare even more by choosing ski goggles with mirrored lenses. Basically, the outside of the lens is mirrored, which reflects more light and get better visibility in bright conditions. Double Lenses: for skiing and snowboarding, this type of lens is great because it creates a thermal barrier to greatly reducing fogging. UV Protection: As you increase in altitude, the UV also increases, which isn’t great for the health of your eyes. That’s why most snow goggles have 100% UV protection. You should definitely buy snow goggles with 100% UV protection. Polarized Lenses: This type of lens also works to reduce glare. It works by filtering vertical light, which improves clarity and gives you increased definition and contrast. Photochromic Lenses: This is the most versatile type of lens because it is designed to automatically adjust when light conditions change. The adjustment isn’t instantaneous and takes a few minutes. Another feature that you sometimes see are vents to help with anti-fogging. As long as you don’t block there, you will have a better experience when it comes to preventing the fogging of your goggles. As you compare all the different ski and snowboard goggles, you will notice that frames have some variation when it comes to shape and size. The main purpose of the frame is to keep the lens in place and keep the snow out of your eyes. But you also want to go with a frame that is comfortable to wear. And that means checking out some of the more specific frame features to get the optimal fit. Though some snow and ski goggles are one size fits all, the higher quality goggles are available in different frame sizes. As you shop, one thing to keep in mind is that most of us can actually fit into more than one frame size. A good rule of thumb is to base your frame size on your head size, which is easy to do if you know what size helmet you wear. Small: this size is good for adults with small faces as well as kids and teens. Medium: this size fits most adults. Large: this size is good for adults with larger faces. Over The Glasses (OTG): this size is good for people who want to comfortably wear their prescription eyeglasses under their goggles. When you wear these, your glasses should not move and it should be a comfortable fit. Oversized: this size is good for people who want better peripheral vision due to the larger coverage. Just keep in mind that this type of frame doesn’t work with all helmets. Choosing a frame is about more than just getting the proper size for your head. There are a few more features that you can look for when you’re buying snow goggles. Strap: Definitely look for an adjustable strap for the most comfort and best fit. Typically wider straps are better since they are more comfortable and easier to adjust. Google Gap: try to find goggles that don’t leave a huge gap between the top of the goggles and your helmet or beanie. That exposed area of skin will get really cold and be uncomfortable. Helmet Compatible: in addition to the gap, you’ll also want to make sure that your goggles fit well with the strap around your helmet. You need to make sure that you don’t have any gaps and the fit it smooth. Face Foam: when you put the goggles on, there should not be any gaps between the foam and your face. The fit should be snug and consistent, without pushing on any pressure points and causing pain. When you try on your snowboard and ski goggles, having a good fit is essential. There are a few common problems that people experience when trying on goggles. If you have any of the problems below, follow our suggestions to get a better fit. Temple feels pinched: Loosen your strap and see if you get any relief. If not, you need a pair of goggles that are wider. Bridge of nose feels pinched: The goggle may be too low on your face, so tighten the strap to get it up a bit higher. If that doesn’t work, you can either look for goggles with a different bridge shape or go with a smaller fit. Outer eye socket pressure: You need a frame that is wider to get a better fit for your face. Bridge of nose has a gap: Loosen the strap because you may just have the goggles up too high on your face. If that doesn’t work, you need goggles that have a larger bridge. Never place the goggles on a surface with the lens-side down. Clean the lens only with a soft cloth or anti-fog cloth. And never wipe! Instead, blot with the cloth or you might damage the coating. Store your snow goggles in a soft bag. Most come with such a storage bag. Air-dry the goggles before you put them away for storage. Never dry or store the goggles in direct sunlight or high temperatures, such as on the dash of your vehicle. By following these tips, you can keep your goggles working properly for many seasons of snow activities. Even though many snow and ski goggles come with anti-fogging measures, there are still a few things that you can do to ensure that your vision stays clear of fog. When snow gets on your lens, shake it off instead of using your gloved hand to remove it. The glove surface can be abrasive and damage the anti-fog coating. You’ll also want to shake free any show that has gotten in the vents. Try to avoid sliding your goggles up on top of your head. This will definitely result in fogging. Once fogged up, you can try shaking them to clear the lens. Or, you can put the goggles into a warm jacket pocket. If that doesn’t work, you’ll have to go back to the lodge to de-fog them – if you’re not carrying an extra pair of goggles with you. Really thanks for sharing this useful post. This article gives very good information and covers almost all the important things about ski and snow goggles and also about their lenses. This post will help me in my future.